These words ring particularly true for all of us at General Plastics. Nearing our 73th birthday, history is a defining factor of who we are today, and will continue to shape us in the years to come. 73 years ago this month, General Plastics was born – December 1st, 1941. What started as a preservative chemical operation out of a garage (as so many companies have) was soon elevated to a luxurious shack rented for a whopping $50 a month. The man behind the operation was Lou Schatz, whose background in the logging industry prompted him to get into the preservative business. This consisted of wood preservative chemicals for wood fibers, and fabrics made from wood resins. Not long after, Lou began manufacturing coatings products, developing various materials used for coating and preserving things such as fishing nets, fire hoses, and adhesives for wood, along with some solvents on the side. Then there was WWII. 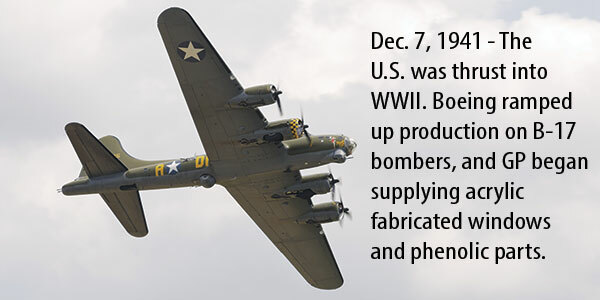 During this time, Boeing was “taking off” making B17s, and their production could barely keep up with demand. For that reason, Boeing was looking for companies who could make different kinds of materials or plastics for the aircraft. While Lou had no experience in this area of work, he realized it was a golden opportunity, and placed a bid on some work for them. Lo and behold, Lou got the Boeing order, and just like that, as the US was thrust into WWII, General Plastics was thrust into a new business. Yet Lou was so glad for diversification, he didn’t even care if he made money off of it, and, at the beginning, he didn’t. But as time went on, General Plastics adapted, and the acrylics business, mainly as plexiglass for the windows, grew. General Plastics started working with Bakelight, one of the very first plastics, responsible for forming, curing, fabricating, and machining it – all for different parts of the airplane. The partnership with Boeing blossomed. General Plastics prospered during this time, just as so many companies did, due to the necessity of war materials. Having a family at home, Lou also didn’t mind being exempt from the draft, since he was producing something for the war effort. Towards the end of the war, General Plastics was producing at a tremendous rate. However as soon as the war was over in 1946, all contracts were canceled. As the world worked to rebuild itself, and soldiers learned to assimilate back into their old life, General Plastics adjusted to business without Boeing. This resulted in a shift to acrylic coatings (an acrylic urethane copolymer) called Gloze. Its purpose was to give a surface a permanent wax. Additionally, Lou and his team began making translucent, corrugated fiberglass reinforced plastic for things such as greenhouses, patio covers, and skylights, and acrylics for windows used in commercial facilities. During this time, when the future was looking grim and hopes deferred, business did something it’s sometimes known to do after it slows down: it picked up again. In the early 60s, Boeing had another boom, and as they grew, so did General Plastics. Except this time, we played a bigger role, manufacturing additional products such as interior pads for the overhead stow bins. This success soon transitioned General Plastics to the aerospace front, with our products playing a part in the exclusion risers of Apollo, and in every Saturn 5 rocket that was launched during that time. In the years since, General Plastics has experienced a wide range of diversification. Our products can now be seen in nearly every industry, including construction, medical, signage, sports & recreation, nuclear containers, as well as a variety of tooling applications. Yet we would not be here today had it not been for our eventful (and challenging) past, and our commitment to always looking for ways to improve in the future – it’s in our chemistry. That’s why we believe only when employees are engaged in a common vision can we solve our customer’s problems, which enables our mutual success. It’s proven history, yet history in the making.